As a result, we’re not easily cowed in these parts. Over the years, our hardy residents have braved dusty Forty-Niners and noose-happy vigilantes, communists and Beatniks, Hippies, Swingers and every manner of frightening newcomer with aplomb. Sure, some of these tech folks are a different breed of scary altogether–but I digress. My point is, change is in the air. And to make sure you’re not left behind in the early fog, it’s time for the North Beach Fix: all the North Beach news that’s fit to spit. There is a lot to cover this time around, so let’s have at it, shall we? The biggest story in the neighborhood right now is the battle over the temporary closure of Washington Square Park. As I’ve reported for the San Francisco North Beach Business Association (SFNBBA), there have been ongoing negotiations between San Francisco Rec & Park and the SFNBBA, North Beach Neighbors and other neighborhood advocates about this closure for months. The city calls it a “Park Improvement Project,” and among other benefits, city engineers claim the work will improve soil conditions in the park, and save two-thirds of the water the park currently consumes. The project, originally slated to take 12+ months and cost over $3 million, aims to replace topsoil, repair the park’s irrigation system and replace its walkways. The plan has been opposed from the get-go by Marc Bruno, North Beach advocate and one-time candidate for District 3 Supervisor. He has lobbied vigorously for an alternative plan that was presented originally. That plan called for far less work, cost only $184,210–and saved the same amount of water. Having failed to do proper public outreach prior to the plan’s approval, Rec & Park managed to put the neighborhood on high alert months ago when they managed to secure that approval anyway. 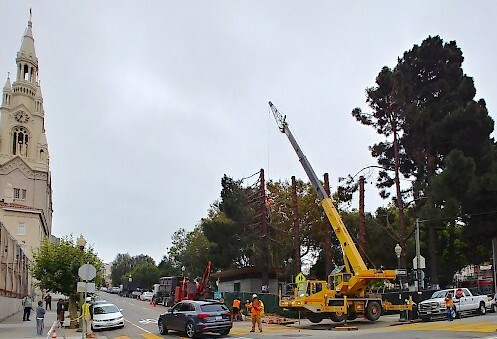 The agency has since fumbled the ball several times, and they recently managed to outdo themselves: Contractors working on the playground project at the corner of Powell and Filbert Streets–which Rec & Park is in charge of–damaged the roots of ten trees that had stood in the park for nearly a century. And at the beginning of this month those trees, Nine Canary Island pines and an olive tree, were cut down. The city claimed the root damage had rendered the trees unhealthy, and thus dangerous. You’ll recall that in 2016, a large branch fell from one of those Canary Island pines and struck a mother playing in the park with her daughter, paralyzing her. The city reached a tentative $14.5 million settlement with the woman just last month, which makes me wonder if this “root damage” and subsequent tree removal wasn’t some sort of liability calculus on the part of the city. And if you’re observant, you might have noticed that the removal of those trees has cleared the way for fabulous views of the church from the new million-dollar condos across the street. Indeed, there is only one tree left in the way of those pricey views, but it sits outside the playground in the park proper. With the work to come, I can’t help but wonder if root damage might be in that tree’s future. Whatever the case, this botching of the playground project only worsens public concerns about Rec & Park and their oversight. And the project they propose for Washington Square Park is far bigger. Its impact on North Beach will be enormous; the entire park will be shut down for at least six months. The idyllic center of our neighborhood will be an inaccessible hive of dust, noise and exhaust for that entire period. After much effort, the SFNBBA was able to wrangle a passable mitigation plan from Rec & Park. But there are still worries that this project, slated to begin in February 2019, will wreak havoc here. Marc Bruno makes many good points, especially when he points out the potential for work to be prolonged indefinitely because of archaeological finds. Fact: there will be an archaeologist on site at all times, and the law mandates an immediate shutdown and site evaluation if something of significance is found. This being a historic site, the likelihood of that is disturbingly high. I agree with Bruno that there are simpler options, and think they should be more fully explored. I’ll be reporting more on this topic soon. Meanwhile, we’ve got big anniversaries coming up in the neighborhood for two beloved spots, legacy businesses both: Vesuvio and Macchiarini Design. First off: Vesuvio, which is celebrating seven decades of dignified debauchery this Sunday, September 30. Founded by Henri Lenoir in 1948, Vesuvio may just be the quintessential San Francisco bar. Starting out as a bar-slash-gallery, over the years their proximity to Beat poet Lawrence Ferlinghetti’s City Lights next door has made them ground zero for tourists who remember Kerouac from freshman lit class. In turn, that notoriety has allowed the place to build a stellar staff, and incubate a crop of fiercely faithful regulars. Vesuvio isn’t a bar, it’s the bar. So make the pilgrimage, and come down this Sunday between noon and six to join us in celebrating the milestone. There will be a live performance by Barrio Manouche, along with speakers, poetry and of course the best bartenders this side of our blessed Bay. Beat era attire is encouraged, but thankfully not required. Dig out your beret, and we’ll see you there. As it happens, Grant Avenue mainstay Macchiarini Creative Design is also celebrating its seventieth anniversary this month. This legendary North Beach gallery and metal shop has been doing business on Grant since 1948, and claims to be the oldest continuously operating design house and gallery for modernist metal arts in the country. It is the sine qua non of legacy retail in North Beach, and proprietors Danny and Emma Macchiarini are second- and third-generation owners, something unique even in North Beach. There’s a lot to be thankful for, and this should be a great party. Things will be starting promptly at 6:00 pm, and there will be music, poetry and lots of good food and wine in the offing. Be sure to mark your calendar for this one. Happily, North Beach has some new spots on the radar as well. At long last, Barbara (431 Columbus Ave.), the new project from the owners of Il Casaro and Pasta Pop Up, is open for business. The North Beach veterans serve ‘pinsa,’ a Roman precursor of pizza made with soy and rice flour in addition to the traditional wheat flour. It’s thinner, crispier and more digestible, making it a natural play for today’s glutophobic gastronomes. This is one of the most central locations in the neighborhood, and it’s great to see it active again. These guys know their way around an oven, and a quick taste at their soft opening confirmed they’re already on the right track. I’ll be back here with a full feature soon. Meanwhile, we’re picking up another new spot, this time on the troubled block of Columbus between Union and Green Streets. They’re called Crepes A Go Go, and you can find them the former location of Cornology at 522 Columbus Avenue. This crew garners solid reviews at their crepe stand in SOMA, and I’m guessing their savory and sweet crepes will be well-received in the neighborhood. Meanwhile, just steps away at 500 Columbus, another longtime business has been sold: ownership of eighteen-year stalwart Caffé Delucchi is currently being transferred to Captain Kona Inc. No word yet on what the new owners have planned, or if they intend to keep the current name and menu–but we’ll keep you posted. Of course, regular readers of the blog have noted the sad demise of Panuchos, the dynamite Mexican hole-in-the-wall next to Sam’s on Broadway. 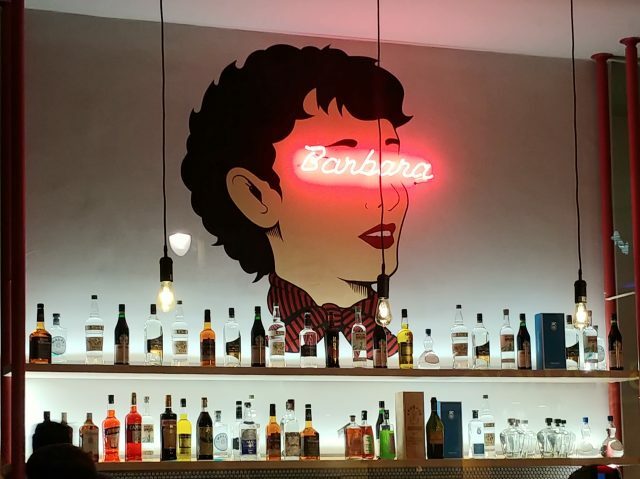 And it’s not exactly news, but I can report that their worthy Yucatecan successor, Barrio, is getting off to a great start. They opened in the old Boardroom location when the local tavern moved across the street, and they’ve been serving a limited menu since July. These guys grind their own masa from blue corn, making for some pretty outstanding tacos. Check them out at 1609 Powell. Last item: four or five different entities have applied to open cannabis dispensaries in North Beach this year, and there are a couple of applications that still appear to be standing. One of them shows particular promise: the owners of Barbary Coast and Grassroots are vying to open a spot on Grant Avenue next door to Tupelo. They do a great job at their other locations, and their reputation lends them credence in the approval process, so hopefully that bodes well. And from a local standpoint, it would be good to see one of the better players in the category in the neighborhood. That’s it for now, but make sure to get back here often for all the latest rumblings in the Beach. Enjoy the bipolar weather, and I’ll see you on the street!